Developing strong basics while having fun! All of our classes stress sound basic gymnastics skill development while putting a focus on the kids having a great time. Most of our parents tell us their children bug them days in advance of their class if it is gymnastics day! Our goal is for the children to be feel like they are playing while learning important physical, as well as gymnastics skills. 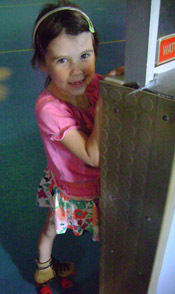 In addition to our normal classes we also offer hybrid classes for home schooled children. Check out the program right for your child. For Children 18 months to 3 years old, this class will allow your youngster to explore gymnastics with your help. Our coaches will help show you how to help your son or daughter learn proper and correct technique. For 30 minutes you will help your child explore basic movement and gymnastic skills. Your son or daughter will walk down the beam, swing on the bars, and bounce on the tramp. Some lucky ones will even get to put the gym to sleep at the end of their class! For Children 3 yrs to 4 yrs old this class will give your son and daughter a chance to learn basic movement and gymnastics skills. Our coaches will help your son or daughter learn proper and correct technique on basic skills. For 45 minutes your son or daughter will walk down the beam, swing on the bars, and bounce on the tramp. This class allows your toddler to learn how to work with others in a preschool like environment. They will be exposed to many of the basic concepts which will translate to future gymnastics success. A fundamental gymnastics class geared for a 4-5 year old. All of the same drills and skills a beginner will learn boiled down for a slightly younger gymnast. With the skills a young one learns here he or she can move directly to the Advanced Beginner Girls or the older boys classes. Boy's not just a Money maker! While many gyms offer boys classes we offer more then just a chance to play around while the girls learn how to do gymnastics! 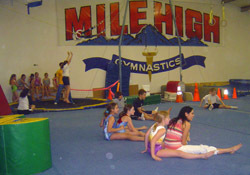 Mile High has a great boys program and from ages 6 and up they are put in Boy's only classes. Boy's in our gym will learn all of the basics taught in other gyms, but will also have a chance to learn from qualified instructors how to swing Pommel Horse and Rings, events usually avoided by other schools. Our program has been recommended by local Martial Arts schools to help teach discipline, body awareness, and strength. Whether your son wants to be an Olympian or just be stronger for another activity our program has a place for him. If your daughter has never done gymnastics before our Beginners or Advance Beginners class is the choice for you. These classes will introduce and refine the basic skills young girls need to be competent gymnasts. Students here will spend their time learning the essentials on all of the competitive events in competitive gymnastics as well as basics on Trampoline. Advance Beginners: For girls 10 and older.